NRG XC was designed on the foundations of the NRG PRO. It has the same advantages of a professional slalom racing wing in a XC oriented package! It is a small, safe wing that allows fast flying for cross country ventures, expanding the possibilities for any experienced pilot. Following the market feedback from Force II about ABS®, it was the natural next step for NRG XC. It improved the wing dramatically, shaping it as an even better XC oriented wing and polarizing the difference between flying at trim speed and accelerated flight. At trim speed - always restless, super agile, fast wing with quick responses and incredible flying rush. At accelerated flight the ABS® system comes into play automatically - generating a stable, efficient cross country machine. ABS® is a system which automatically and gradually pulls down the tip steering as you release the trimmers and push the speed bar. 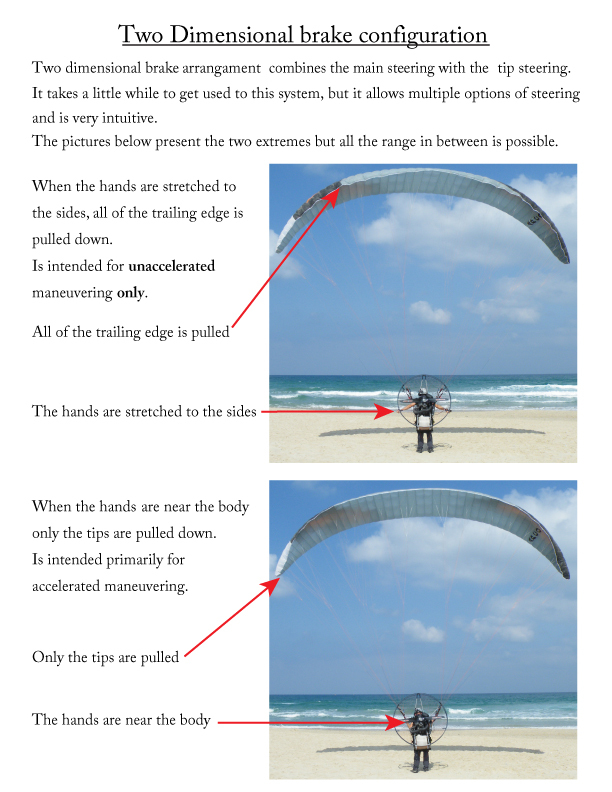 This action stabilizes the wing , cancelling roll movement, "planting" the pilot under the center of the canopy. This outstanding roll stability gives the pilot the best and most efficient flying path at high speeds! It is on cross country flights or when chasing down a friend that the ABS® system comes into play. The ABS® system will get you from point A to B in the fastest way possible with no pilot input. On trim speed, the system is not activated, allowing dynamic flight tuned for thrill and agility as should be with a true slalom racing wing. With the ABS® tip steering handles together with the main 2D brakes in hand your every touch will be rewarded with an energetic and precise response , satisfying even the most demanding pilots! Additional difference between the XC and the PRO is the line set. The NRG XC II uses sheathed lines for improved durability on harsh take-off surfaces. Top lines are are life-time warrantied, embedded hook-in points EHP® for improved aerodynamics. The SRS® system will come into play whenever the pilot makes an error that causes stall behavior. It will automatically protect the pilot by lowering the angle of attack if the wing goes into a stall/parachutal/spin. NRG XC II takes-off and lands at slower speed than you would expect, making flying easy. All thanks to new highly efficient reflex profile. NRG XC II will excite every experienced pilot - you will be infected by the xc racing virus instantly. NRG XC II purpose built for speed and agility, fun flying, and long distance speed racing. WARNING: DO NOT! test fly this wing, unless you are ready to buy it! This wing is highly addictive! NRG XC II Official Video – technical features included! ABS®, OAA®, Flexon battens® , HIT Valves ® ,SRS® and embedded hook-in points are exclusive APCO innovations, often imitated, never matched!! The wing uses the same long lasting cloth and fully sheathed durable lines as on previous APCO wings. This is to guarantee its integrity for entire expanded lifespan of the wing. Nevertheless we made maximum effort to reduce the weight of the wing thanks to advanced solutions applied. APCO is traditionally known for using materials and building techniques which offer double and triple lifespan over the expected. The glider is made from tear resistant Ripstop Nylon cloth, which is P.U. coated to zero porosity and then siliconized to give the fabric high resistance to the elements. Different cloth is used for the top, bottom and ribs due to their different functions.